Sarah and Michael incorporated every inch of Tarrywile’s mansion and grounds into their wedding celebration. The couple prepared for their day with their bridal party in the second floor bride and groom suites. As you can see in the photo to the left, the women are gathered together offering advice, support and sharing memories. 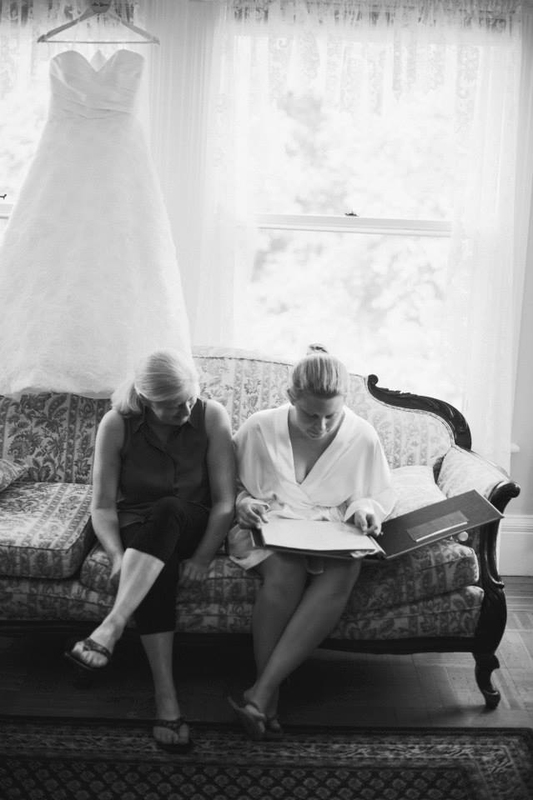 A picture of the mother of the bride and her aunt was taken while they looked through old memory albums while the bride and her girls got ready for the ceremony. Sarah was walked down the aisle of the grape arbor by her mother while her guests, seated on both sides shared in her happiness. 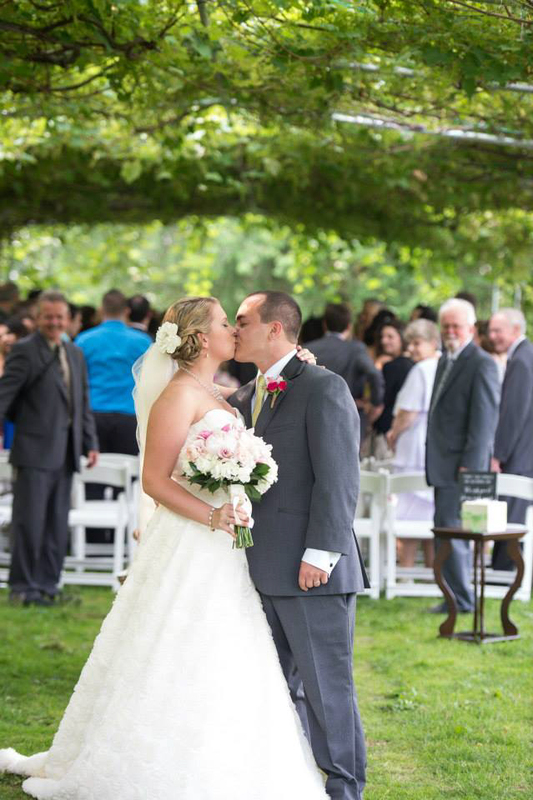 The grape arbor can seat up to 150 guests, chairs for outdoor ceremonies are not included in the rental fee. You will notice how lush and vibrant the colors of the grape arbor are in the month of June. The full leaves offer a welcome amount of shade for the wedding guests. After the ceremony, as Sarah and Michael go off to have their pictures taken, the wedding guests move to the veranda for cocktail hour where they enjoy drinks and food until the bride and groom join them. The veranda is the perfect place for guests to congregate after the ceremony and before the introduction of the new Mr. & Mrs.. 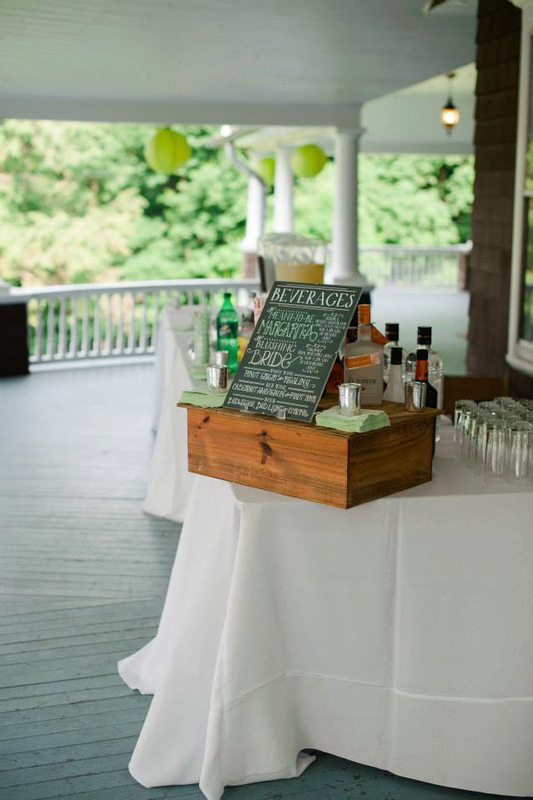 The veranda was purposefully designed as a space to entertain friends and and business leaders. The high wood slat ceiling and wrap around design make it the perfect place to socialize, dine or in inclement weather hold your wedding ceremony. One of the many advantages of having your wedding at Tarrywile Mansion is the ability to choose how you want your event to flow. Sara and Mike chose to place their D.J. in the conservatory and have the dance floor in the formal drawing room. Other brides choose to have their dance floor in the grand foyer, its all up to how many guests you have and what style reception you are planning. Sarah and Mike worked with Tom Divine of Ciao’ Two Steps Catering to plan their reception menu as well as the logistics of dining and dancing. Mother and daughter reminisce during a quiet moment alone in the bridal suite on one of our comfy antique sofas. The blushing bride made her way down the aisle with her mother by her side. 100 guests sat under the magnificent grape arbor to watch Sarah and Michael become husband and wife. Incorporate some history into your photographs like the old stone chimney which sits near the grape arbor. With rolling hills and sweeping views of the farm land below, the overlook is the ideal spot for majestic wedding photos. 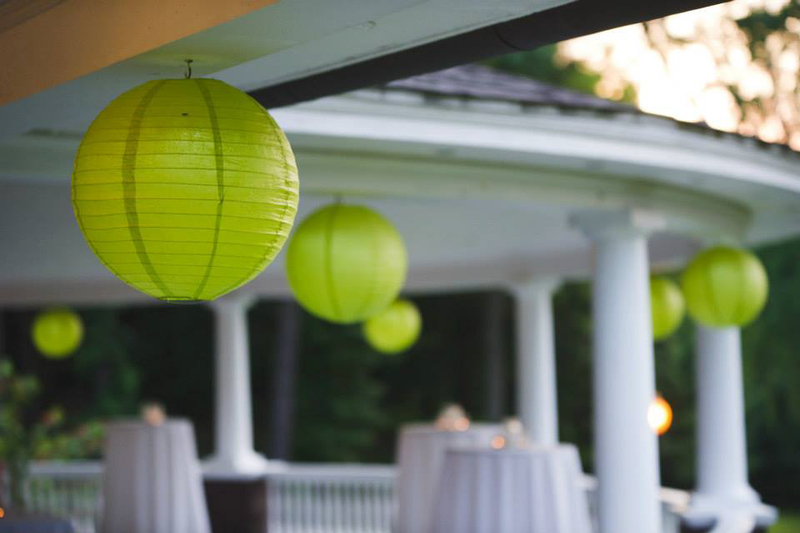 Decorated with fun paper lanterns, the veranda is the perfect spot for cocktail hour. 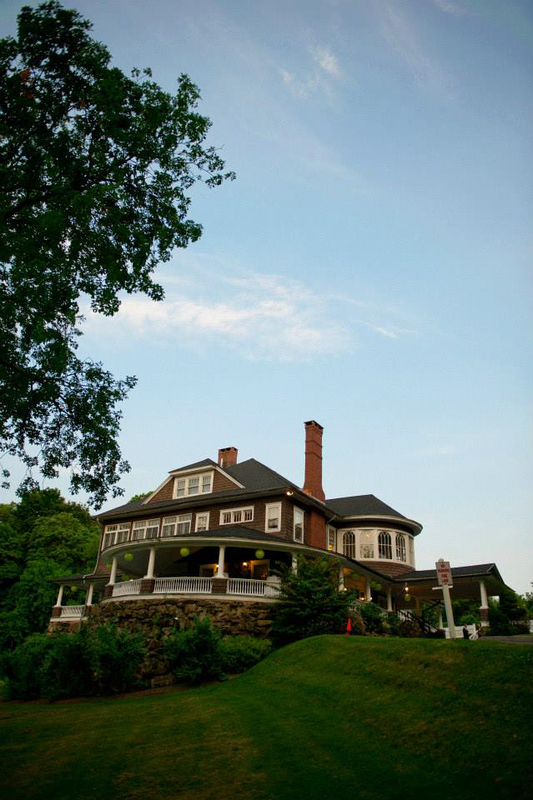 With sweeping views of the Danbury hills, this is also the perfect spot for a ceremony. The elegant tablescapes awaiting guests as they made their way into the mansion for a sit down dinner. Sarah and Michael shared their first dance as husband and wife in the drawing room. After dinner, it was time to dance and dance they did! 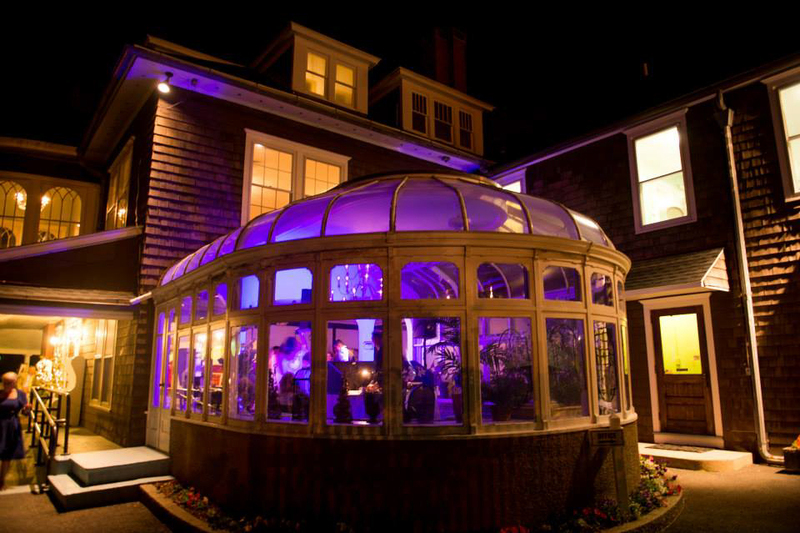 The drawing room and conservatory was the perfect spot for the DJ to spin some tunes.